Over the last couple of weeks I’ve been thinking about VDI and its wider impact on delivering end-user computing to end-users. The question I’ve been asking myself is one about the future which has yet to come – in 10 years time with the benefit of hindsight – will we look at VDI as major milestone in the world of virtualization and application delivery or as mere blip or stepping stone to another way altogether. In part the question has been inspired by a number of announcements and acquisitions by VMware in recent months. ThinApp Factory – a kind of automated method of whole scale conversions of software into ThinApps ready to work in it own “ThinAppStore” or advertised via Horizon. As you can see VMware has been busy acquiring “applications” that don’t necessarily need a full blown PC based operating system such as Microsoft Windows. Information is a bit thin on the ground on AppBlast which sounds on the surface like a type of XenApp/RDS style server-based compute environment. It’s clear that this is the direction that VMware want to go in – and it seems to suggest that the VDI initiative (a bit like virtualizing servers) will be increasingly become just a small part of what VMware can offer customers. In away you kind of see the “operating system” is becoming increasing degraded in value. Right now the best VDI projects use some kind of “linked clone” to create multiple desktops with minimum time, effort and disk space wasted. Then the business does its level best to install nothing into the guest operating system. The OS then becomes merely a “shell” from within which we can stream virtualized or sequenced applications into with things like ThinApp, Spoon or AppV. Of course its only possible to stream a certain portion of applications to the desktop – there applications that many companies still to this day install conventionally into Windows – such as Microsoft Office. So if you like virtualization of hardware (ESX) and virtualization of software (ThinApp) have increasingly squeezed the significance of the bit that sits in between the two – the operating system. For the moment there’s life in the old dog still – there are plenty of “legacy” Windows .exe’s out there create demand for either server-based compute, or virtual desktop compute. But as time drifts by and a new generation of folks who grew up with web-based mail and collaboration sites (facebook, twitter et al). Perhaps we will see VDI as just stepping stone. OR perhaps not even that. Despite the growth of VDI in recent years it has been stymed by the cost of ownership. Especially on the storage side – where despite valiant efforts by virtualization and storage vendors – there’s still relatively high cost both in terms of disk capacity and IOPS that makes it a challenge to scale VDI in the same way that was possible with banks of server-based systems. In fact one of the most impressive server consolidation arguments is using virtualization to consolidate the servers that make up a RDS or XenApp based “server farms”. I say this not dismiss VDI. But in many ways it apes the “old way” of doing things. A desktop for individual user, rather than a shared session on a TS box is much the same principle. These new acquisitions by VMware are an attempt to introduce a new method of delivering applications that does away with a bloated OS with bloat applications installed to it. The interesting question is to ask where does this stop? Does VMware add a word-processor, spreadsheet, note-taking, and other “office” like applications to its stable. Where does that put VMware? In direct competition with GoogleDocs or Office 365? OR are VMware working toward offering these same services but internally on a secured corporate network? Leading that speculation to one side for now. I think its important to understand the importance of stepping-stones. Think about what stepping-stones enable in the real-world, and you will begin to see the analogy. 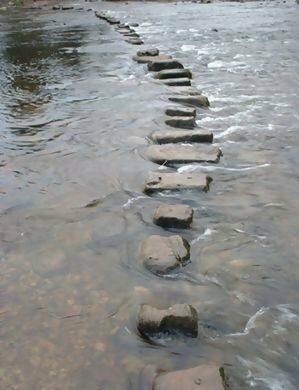 Without stepping-stones we must take massive leaps from one side of the bank to another – containing a raging flowing river. Stepping-stones allow us to take a more gradual approach to getting from A to B. I think if VDI is done right then it could be well be a very useful stepping-stone to the next generation of application delivery. For example – if you correctly separate the OS, Applications and Persona from the “desktop” – then this could put you in very good position for making your virtualized applications available to ThinAppStore or Horizon. The future is clearly some cloudy application delivery method – but I don’t expect that future to arrive completely on Tuesday of next week. It’s an evolving space, and its not as if those pesky legacy Windows applications are going to disappear on Wednesday of next week….